Description: Paris violin maker Jean-Baptiste Vuillaume (1798-1875) achieved tremendous recognition during his lifetime for his beautiful and consistent workmanship and the responsiveness of his instruments. His workshop employed many of finest best violin and bow makers of the day. They produced instruments inspired by models from Stradivari, Guarneri del Gesu, Nicolo Amati, and Maggini. Some of these instruments were “bench copies” with skillfully antiqued varnish made as meticulously detailed replicas of especially notable instruments. Capitalizing on his popularity, Vuillaume introduced the St. Cecile des Thernes line of violins to serve a broader audience of musicians. These instruments, produced from about 1844 until 1856, bear the image of St. Cecilia, the patroness of musicians, on the back of the violin. The banner below the image reads “St. Cecile des Thernes” (Thernes was the name of the town where his country house was located outside of Paris). 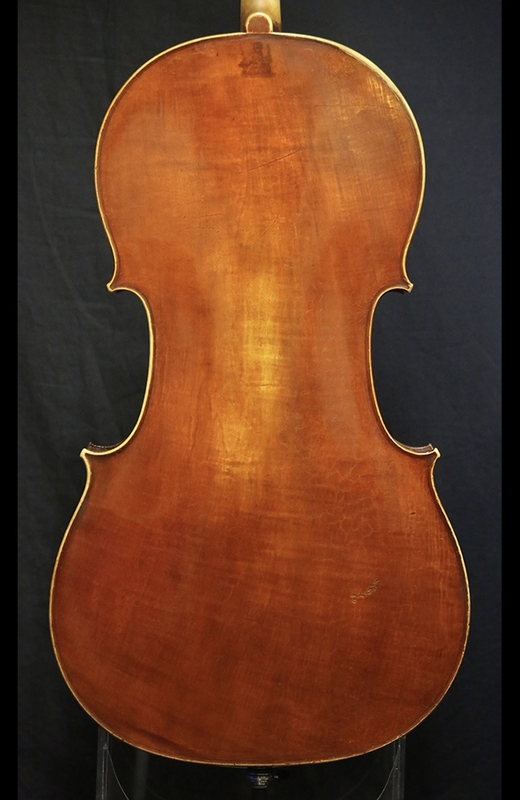 The violins were constructed in the Mirecourt workshop of his brother Nicholas Vuillaume, and sent “in the white” to be finished and varnished in Jean-Baptiste Vuillaume’s Paris workshop, thus allowing Jean-Baptiste to maintain final control of the work and quality of his more affordable line of violins. 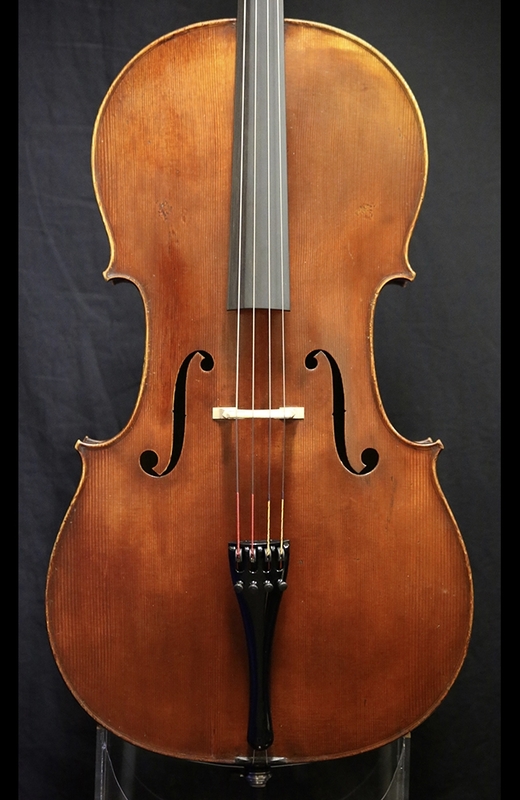 The Vuillaume St. Cecile we have for sale is a Stradivari model, dated 1849. It has an attractive one-piece maple back and is in remarkably pure original condition. The sound is clear and robust with a warm center. 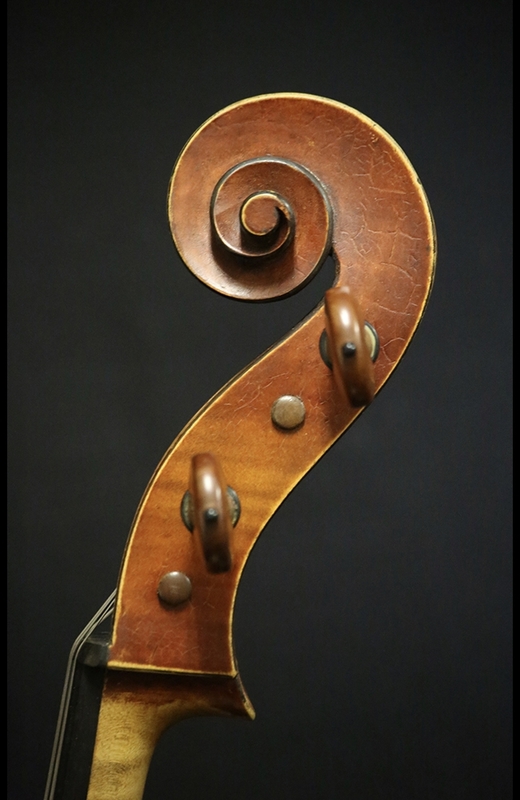 This cello was formerly owned and played on by the late Mark Tanner who used this as his primary instrument. with a very clear, strong, and robust sound, and is suitable for the finest of players. Body Length: 75.8 cm.